Dozens of countries are introducing legislation restricting the use of electronic cigarettes, but their proponents say they are harmless and their use could in fact save millions of lives. Could they be right? A group of friends sits around a table in a pub in south London, exchanging stories and putting the world to rights in a cloud of scented vapour. One of them is 31-year-old Jonny Lavery. But three years ago, Lavery realised that as a smoker of 15 years, his chance of doing this was diminishing. Roughly half the world's smokers die from their habit. The trouble was Johnny just enjoyed it too much to quit. Then he found an alternative - the electronic cigarette. These gizmos contain batteries and "e-liquid" - a solution of propylene glycol or glycerine - containing a nicotine dose. A battery inside the e-cigarette heats up a coil attached to a wick. When the liquid is presented to the hot wick it produces vapour which can be inhaled. They don't quite match the nicotine hit of a real cigarette, but they come close enough to have won over 1.3 million users in the UK alone (compared to nine million tobacco smokers). 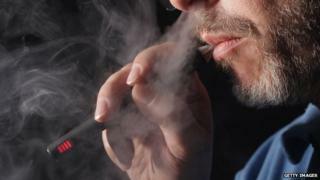 In the US, e-cigarette sales could pass $1bn (£650m) this year - up from $600m (£390m) in 2012. Since there is no smoke, puffing on e-cigarettes is called vaping, not smoking. The group of men and women sitting in the pub call themselves vapers - they meet regularly to vape and to talk about vaping. A little nerdy, they resemble a gang of home-brewing enthusiasts more than a stop-smoking support group. They inspect one another's vaporisers - which come in all manner of shapes and sizes - and sniff one another's vapour. "I'm currently vaping toffee popcorn," says Shari Levy, emanating sweetness. "And this one here is coffee. And this one is tutti frutti - that's nice for the summer. Amaretto with a morning coffee is just delicious." Like everyone else in the group, Levy initially used e-cigarettes to help wean herself off the real thing. After a while she realised she no longer really liked the taste of tobacco. While e-cigarettes can be used as a stepping stone to ending nicotine addiction, some vapers see them as a way to continue a hobby they enjoy without the attendant fear of death. That's because although nicotine is the addictive ingredient in cigarettes many experts do not think it is especially harmful. It's the tar and other nasties in tobacco that kill. "Nicotine is not very dangerous, and it's very unlikely someone will overdose on the nicotine in electronic cigarettes by inhaling the vapour," says Maciej Goniewicz from Roswell Park Cancer Institute in Buffalo, New York - an oncologist who has analysed e-cigarettes and the vapours they produce. He says that in the absence of research into the effects of long-term vaping, it is impossible to say that e-cigarettes are absolutely safe, but we know enough to say they are safer than the real thing. There is no such thing as passive vaping. Nevertheless, a wave of legislation is threatening to extinguish e-cigarettes all over the world. Brazil, Singapore and Mexico have banned importing and selling the devices, even though tobacco is still on sale in all those countries. In the US, state-level legislation inhibits vaping in different ways. Arizona has banned the sale of the products to minors. The same rule applies in New York State, where vaping is also prohibited within 100m of a school entrance. In Washington State, all vaping in public is banned. Is it OK to vape in public? "If you're going to do it you should arm yourself with the legal rubric so that you can say, for example, 'under section 16 of the bill' - or whatever it is - 'I'm completely legal'." What's the etiquette with electronic cigarettes? Draft legislation in the EU - including a UK version that will affect the London vapers - will restrict the sale of e-cigarettes and bring them within medical regulation. Manufacturers will need to be licensed, and the components labelled clearly with their precise nicotine content. The products will not be marketed or sold to young people under 16. So if e-cigarettes are relatively safe, what's motivating all this legislation? One set of concerns has to do with safety and standardisation. The UK body that oversees the regulation of medicines, the MHRA, says e-cigarettes currently available do not meet appropriate standards of "safety, quality and efficacy". Anecdotal reports point to dangers caused by variations in product quality, including facial burns after a vaporiser exploded in a consumer's mouth. The US Food and Drug Administration has also found that nicotine doses vary between devices, and have been found to vary from the advertised dose on the label - while the ingredients in e-liquid are also not listed. Some pressure groups fear that electronic cigarettes may "re-normalise" smoking, thereby undermining the smoking bans which have helped de-glamorise cigarettes - the British Medical Association (the UK's trade body for doctors) cites this concern in calling for a ban on public vaping. Others point to the possibility that the red-glowing tips might prove enticing to children - New Jersey assemblywoman Connie Wagner has also voiced a common fear that children may enjoy the fruity flavours. He adds that if and when young people do start smoking e-cigarettes, public health experts will have to study the causes carefully. Snus is a form of purified tobacco, popular in Sweden and Norway, that users insert between their teeth and their upper lip. It is banned elsewhere in the EU. Snus provides users with an equivalent dose of nicotine to an e-cigarette and without known serious consequences (although a possible link has been made to pancreatic cancer). The organiser of the London and South-East Vapers meet-ups, Alan Hodgson, had tried quitting three times before he found e-cigarettes. Each time a rough spell in his personal life sent him back to the fags. He would like to stop vaping altogether or lower the nicotine content of his e-liquid to zero - but it's not something he feels he needs to worry about too much. "My worst-case scenario is really that I might be vaping for the rest of my life," he says, "rather than dying from normal tobacco cigarettes." You can listen to Health Check on the BBC World Service. Listen to the episode about e-cigarettes via iplayer or browse the Health Check podcast archive.